A new way of finding out the truth about Hate Crime post-Brexit. Update 21 Oct 2017: Latest detailed ONS figures added, which were released on 19 Oct 2017 (these are the ones reported in the media as a 13% overall increase in Crime). See the end of this post. Back in April 2017, I explored in depth the question: Was there an explosion of "hate crime" after the Brexit referendum? That analysis was based on Hate Crime data available up to August 2016 (3 months post-referendum vote). My conclusion was that there probably was an increase in real hate crimes, but by far less than the media (and even the Home Office) were claiming, as they were ignoring important context - see the post for the full analysis. 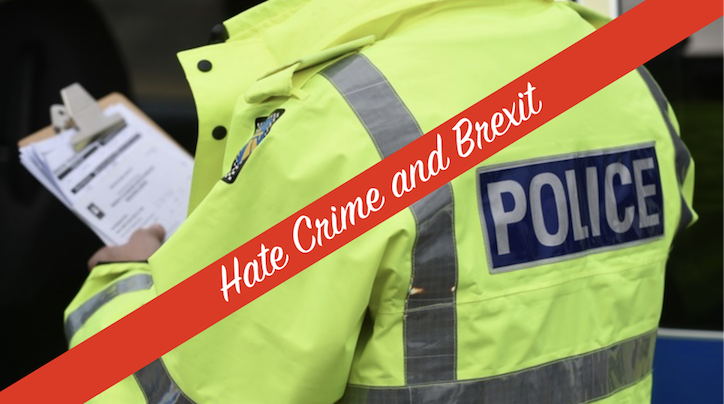 This update is based on additional Hate Crime data available from between August 2016 - March 2017, a full additional six months of information post referendum result. It is extracted from Office of National Statistics information, rather than waiting for data from the Home Office and Crown Prosecution Service. They will be releasing their Hate Crime data officially in the next 2-3 weeks (around 13-19 Oct; Home Office and CPS links), but I have been able to work out a exclusive method of obtaining a lot of it earlier*, and with more context than even the Home Office provide in their official Hate Crime annual reports. Note: with the information below you can actually anticipate the headlines mid/late October ahead of time - like me you can now confidently predict there will be a headlines hyping the fact that Hate Crime has "officially" increased by anywhere between 17% and 23% (depending on date ranges and types of crimes picked), this will be the "highest ever" increase (probably not true), and it will all be blamed on Brexit (almost certainly not true). I use a new technique in this post that I have not yet seen used elsewhere. Rather than look at Hate Crime data in isolation, I take all crimes reported/recorded by the police, and then extract from those crimes the like-for-like equivalents to Hate Crime (this follows Home Office Counting Rules). Example: assault with injury (normal crime) is compared to racially or religiously aggravated assault with injury (Hate Crime). *The Independent obtained similar raw information (but without the analysis) with an FOI request direct to police forces in July, but their report contains verifiably false hysteria (e.g. claiming the murder of Polish man Arkadiusz Jóźwik was a hate crime, which it was not, indeed it was almost the opposite of what was claimed). There is also very probable cherry picking of data/dates to make the most alarmist comparisons as they also do not present any of the raw data, or even a summary of it, you only get the interpretation. Here I will give you the raw data and the analysis, which you can go and check yourself, agree or disagree. Hate Crime is a relatively small problem that has slightly increased. It is still being deliberately hyped for political reasons. 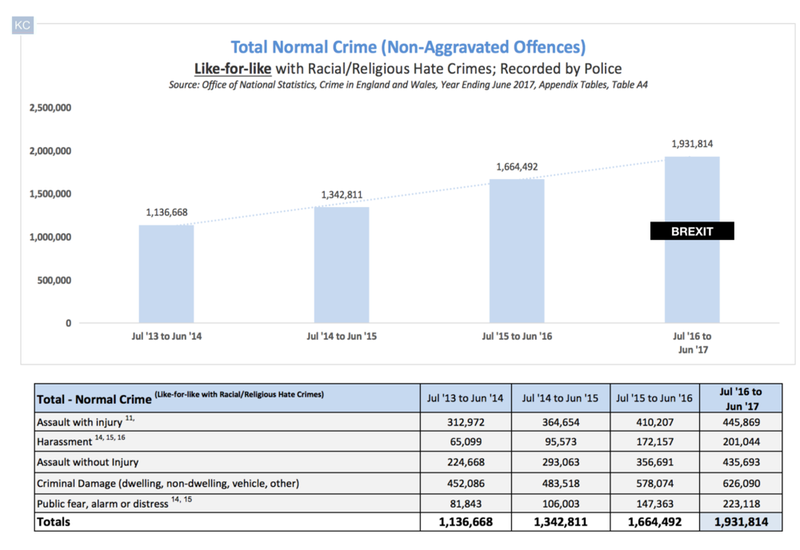 You can see below the overall number of crimes, as well as Hate Crimes / Normal Crimes. These are then broken down further into the exact crimes that constitute each (Assault, Harassment etc). This allows a true like-for-like comparison - I believe this is the first time such a comparison has been published anywhere in the UK for this full 5 year period. There is no discernible spike or trend in either over a 5 year period, apart from gradually up, up and up. 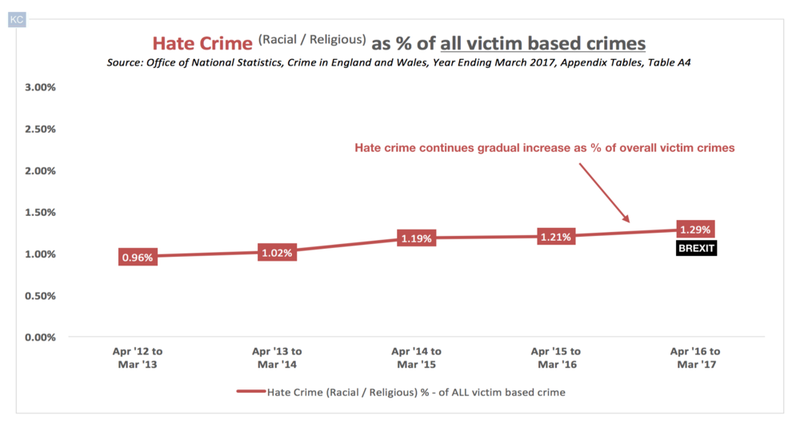 Regardless of Hate Crime - all Victim Based Crime is going up significantly, +9.9% last year, in top of another 8.73% the year before that, wiping out improvements in 2013-2014. Since all victims of crime are still victims regardless of the motivation of the criminal, this seems to be an area that should be focused on a lot more. Both the public and the Police seem locked in the mindset of earlier years where crime was falling year on year. This appears over and has been going on long enough not to be a statistical reporting issue. Was there a really big Hate Crime spike post-Brexit? 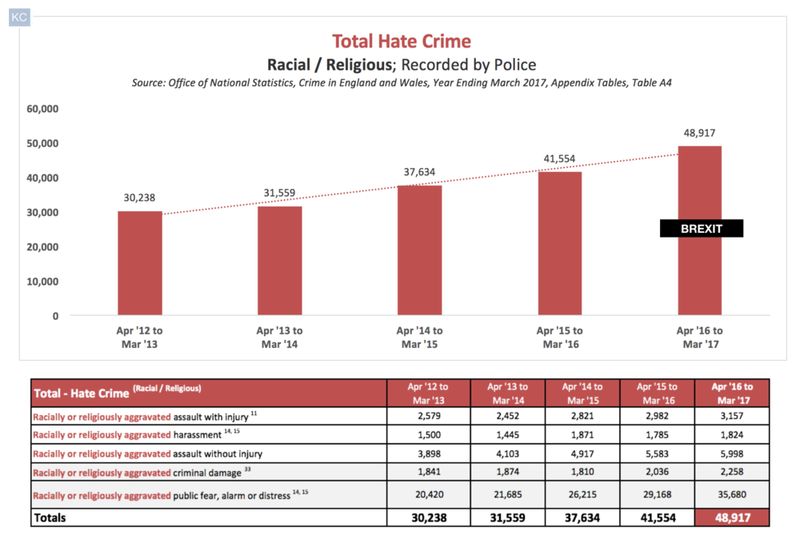 Surprisingly, not really: As noted already above, Hate Crime increased by 17.72% compared to the year before, but: this was only slightly larger than the 15.94% increase in the exactly equivalent, non-Hate versions of these crimes. Based on this data, this isn't a unique Brexit-driven increase in Hate Crime but an overall increase in Assault, Harassment, Public Fear, Alarm and Distress, and Criminal Damage offences more generally. That's not exactly good news - rubbish news in fact - but it does mean the problem is being misdiagnosed, and therefore the solution is going to be suboptimal. Rather than a "Hate Crime Action Plan", I'd suggest the government just needs a better Crime action plan. 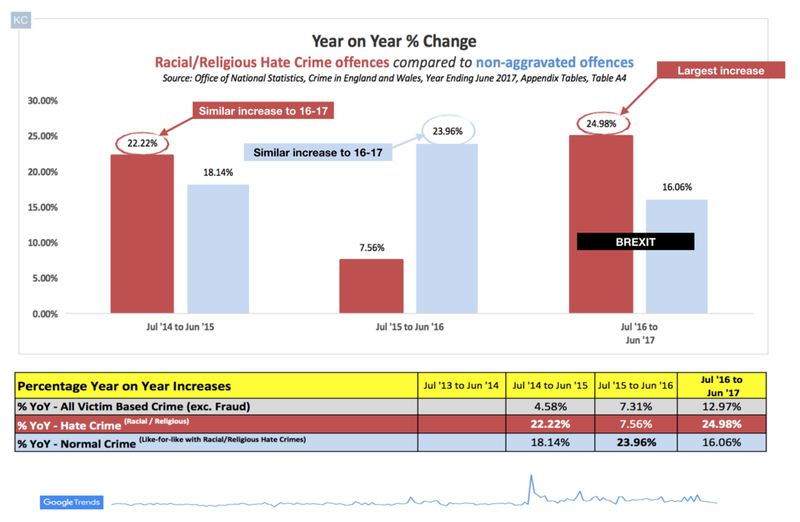 The Hate Crime "spike/surge" post-Brexit was also slightly lower than the increase seen in Hate Crimes (19.25%) in the exact same period between 2014-2015. There was no referendum taking place during this period, so attributing this recent lower percentage increase solely to the referendum or Brexit does not seem plausible. And, this period with 9 months post-Brexit vote isn't the largest spike in this 5 year period - it is the 21.11% increase in normal non-hate equivalent crimes between 2015 and 2016. It is possible that once data is released in Oct, the 12 months purely post-Referendum (June-16 to June-17) may well be as high as this record increase or even slightly higher - but it almost certainly will be in the same broad range. There is only a small difference in the 5 year trend: Hate Crimes increased by 61.7%, Normal Crimes increased by 58.6%, between 2012-2017. Again, not surprising considering the Police push to identify and record more Hate Crimes. 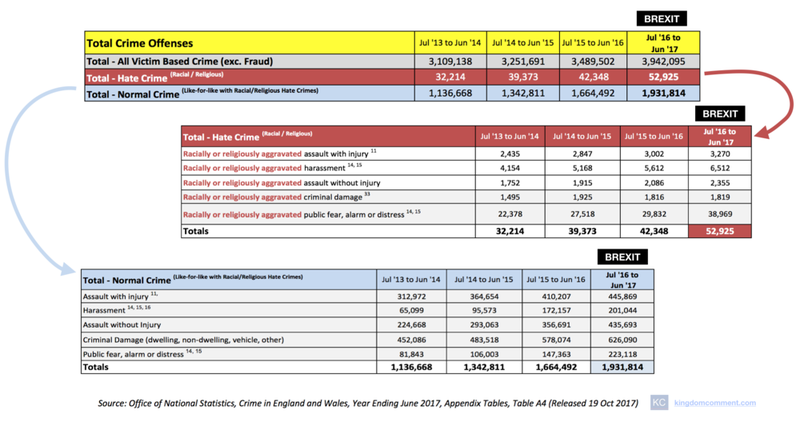 Hate Crimes are very gradually increasing as a % of overall crimes - which you would expect since the Police believe they are under-reported (with a less than ideal evidence base for this; see section on "CSEW"), and haven't changed much as a % of like-for-like crimes (Normal Crimes). 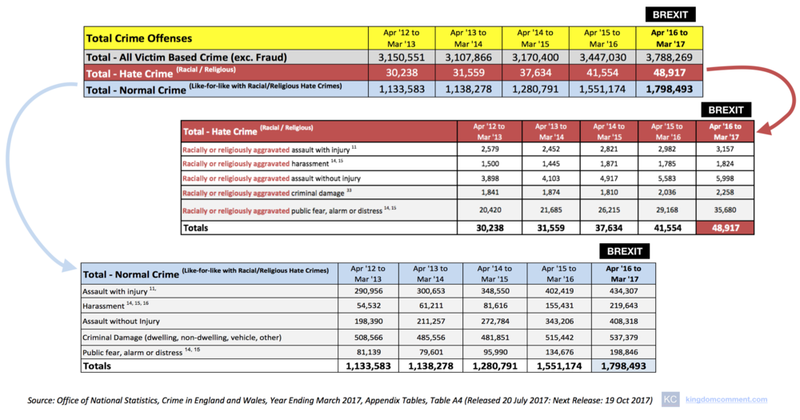 There was a slight increase Apr-2016 to Mar-2017, but Hate Crime is still lower than it was in most of 2013, all of 2014 and some of 2015. By far the largest increase in Hate Crime as a proportion of all crimes, was between Apr-13 and Mar-14. This was about twice as large as that seen post-Brexit. Of course, being a very low % of overall crime (<1.3%) doesn't make the individual crimes any less heinous <- this link is to story of a pregnant Somalian victim who was racially attacked and subsequently lost the unborn twins she was carrying. As this took place in August 2016, this single instance is only one of the 48,917 shown here. I probably shouldn't have to state it but I will: trying to rationally understand what is happening with Hate Crime - facts, rather than hysterical claims - doesn't diminish the sympathy you can have with the victims, or the contempt for the perpetrators. Does this still stack up when you look per capita? Yes. Correcting for the change in the population of England and Wales (which increased by +1.7 million over the 5 year period) makes essentially no difference to the figures (they change by around ~1.30% but the ratios stay the same, and therefore all of the conclusions). As a result, I did not complete any detailed further analysis by capita. According to IPSOS MORI, crime is way behind as a priority issue, with the public ranking Brexit and the NHS far higher. This may be down to how these questions are phrased, but it certainly doesn't yet seem like the public is alarmed by the very large rise in Police reported crime. This new analysis of Hate Crime has only re-inforced the conclusion I came to in April (and writers such as Ross Clark have come to a similar conclusion since): Hate Crime is a relatively small problem that has slightly increased. It is still being deliberately hyped for political reasons. The wider increase in crime is a bigger issue that I thought - with like-for-like equivalent crimes up nearly as much as Hate Crime. This is shocking when you consider the publicity given to Hate Crime and police targets to find "under-reported" Hate Crime. 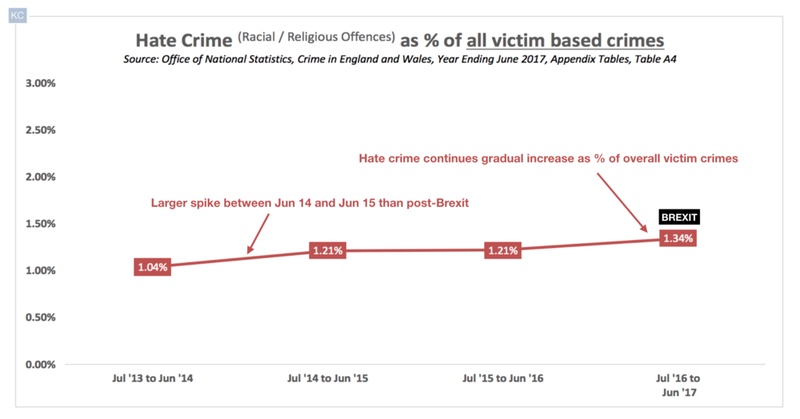 The fact Hate Crime increased at a similar/faster rate two years ago makes it even less credible it can be solely blamed on Brexit and the referendum result (outside an initial spike). Was that "real" Hate Crime increasing in Apr-2014 to Mar-2015, or just increased awareness and reporting? If the latter, why can't it be that for the post-Brexit period as well? As I said in April, I suspect it is a bit of both - and the police agree with this conclusion. As in April, a more definitive conclusion can only be reached when the Crown Prosecution Service release their Hate Crime data. How many of the 48,917 Racial/Religious Hate Crimes merely recorded by the police were actually referred to the CPS for a charging decision? How many were charged? And how many were convicted of a Hate Crime in a court of law? I did submit a Freedom of Information act request for this in April, but this was denied, on the basis it would be contained in the October report, so I am looking forward to reading it. And, I've still seen nothing to suggest the UK doesn't remain one of the most tolerant countries in Europe, if not the entire world. I will do another update on Hate Crime once the Home Office and Crown Prosecution Service release their data in mid/late October. You can download a copy of the spreadsheet used to produce this post. This will allow you to recreate and pull apart any of the tables and images above. It was adapted from the ONS (Appendix Tables ending March 2017), and all changes I have made are noted. If you find this useful or spot an error, please let me know! Note: following a tip from a Home Office expert, this post was updated on 7 Oct 2017 to correct for a small error in values for Normal Crime Criminal Damage - to remove 'threat' offences, which the Home Office does not consider as an 'equivalent' comparable to the Hate Crime version of criminal damage. This slightly reduces the YoY growth of Normal Crimes (by unde 0.5%). KingdomComment regrets the error. The Office of National Statistics released its detailed crime figures on 19 Oct 2017. This allows all of the above graphs to be re-produced, this time with June-June comparisons. See below. All the main conclusions above are broadly the same. I have also added two new graphs, one showing Google searches for "Hate Crime" and the other showing the overall 3 year increase in both Hate Crime and the non-aggravated versions of the same offences. Note the very similar Hate Crime increase in '14-'15 (+22.22%), compared to the post-Brexit period (+24.98%). And this is without an enormous amount of publicity of Hate Crime post-Brexit, and before the CPS and Police first started to run annual "Hate Crime Awareness" weeks. As before, you can download Kingdom Comment's working spreadsheet (adapted from the ONS) to check and re-produce the above data and graphs.